Submitted for: Taras Ortynsky, Descriptive Services Librarian. The Sisters of the Order of Saint Basil the Great Collection is accessible thru the Villanova University’s Digital Library within the Catholica Collection. 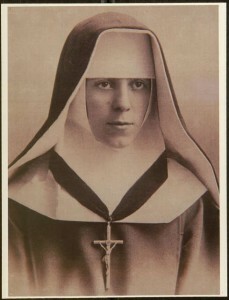 On May 17, 2011, Villanova University, Falvey Memorial Library received items for the purpose of digitizing and cataloging the collection of the Sisters of the Order of St. Basil the Great, Fox Chase Manor, PA. By October 27, 2011, several Falvey Library staff members had digitized and cataloged the collection. Included in this collection are digital images of photographs, manuscript letters, and realia. All of the items are in the Ukrainian language and are dated from 1911-1916. The prevailing theme of the letters is spirituality. Back in November 1911, Mother Helena Langevich, OSBM and three Sister companions came to America from Ukraine at the request of Bishop Stephen Soter Ortynsky, OSBM to serve the Church. The Reverend Stephen Soter Ortynsky, OSBM was the first Greek Catholic Bishop in the U.S.A. The Sisters settled in Philadelphia 100 years ago to care for the Ukrainian orphans and to minister to the Ukrainian immigrants. This November 2011, the Sisters will be in celebration of 100 years in America. The original materials are available at the Archives, 710 Fox Chase Road, Fox Chase Manor, PA 19406. For more information kindly see http://www.stbasils.com. Sisters. They are in safe hands! !